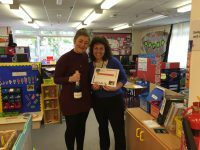 New Directions Education Wrexham have awarded October’s employee of the month to Alison Owen for her continual hard work. Alison has worked with the team since May 2015 and continuously receives excellent feedback for her outstanding work. Alison has worked in many primary schools across the Flintshire area such as Gronant Community Primary, Westwood Community Primary, Westwood Community Primary, Broughton Primary, Ysgol Bryn Pennant, Tir Morfa and many more. Alison commented “I am over the moon and still on a high. My daughters are very proud of their mum. Can l thank Shannon and the team in Wrexham for their continues support in booking me into some lovely schools in Flintshire & Denbighshire. Shannnon what a shock l had, to see you standing in my class holding a bottle of champagne and a certificate. It is lovely to be appreciated for my role in looking after children which l am passionate about. Diolch yn fawr”.